I’m always looking for ways to squeeze more nutrients into my meals and drinks, so when T Plus got in touch and offered to send me some of their new vitamin enriched teas to try, I of course said yes. Before I go any further, I just want to clarify that these are not detox teas…or ‘pootox’ teas – I don’t agree with that kind of thing. T Plus drinks are simply green tea with added vitamins, herbs and fruit. I’ve never been a big fan of generic tea. I know, I’m a terrible Brit! But unless it has about three sugars and a load of gluten-free biscuits to dunk in I’m just not interested. I’m also not a fan of coffee – love the smell, but hate the taste. I am however very fond of herbal and fruit teas, and couldn’t wait to see what all the fuss was about T Plus. The first tea I decided to try was the ‘Immunitea’ and while it was steeping it smelled absolutely delicious! Almost like a sweet shop. When it had finished steeping I was very pleasantly surprised to find it tasted just as good as it smelled. I couldn’t even tell that there was any green tea in there, which is absolutely brilliant because there are loads of people who hate green tea but want to get the health benefits it offers. 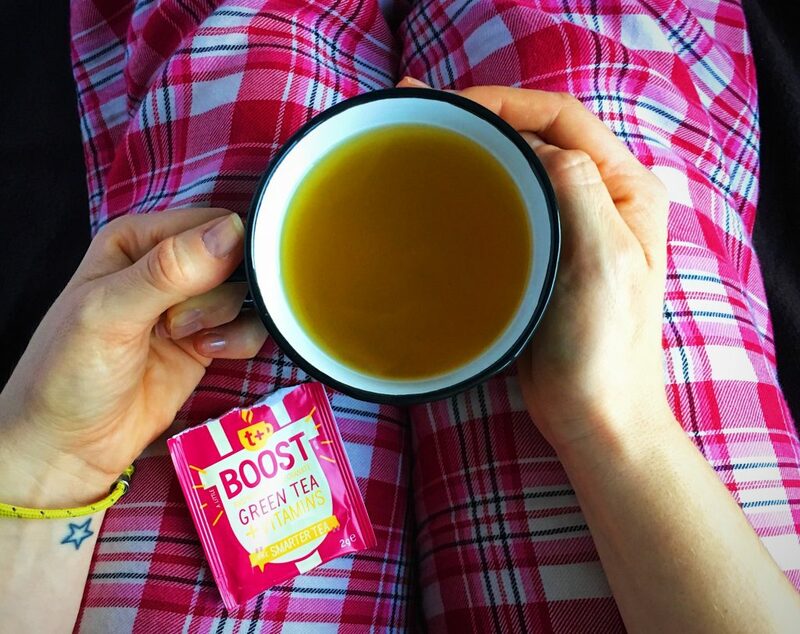 Boost – Green tea with raspberry, pomegranate, yerba mate, ginseng and B vitamins. Multea – Green tea with lemon, peach, rosemary, spearmint, chicory and 9 essential vitamins. Detox – Green tea with apple, blackcurrant, milk thistle, dandelion root, ginger root and B & C vitamins. 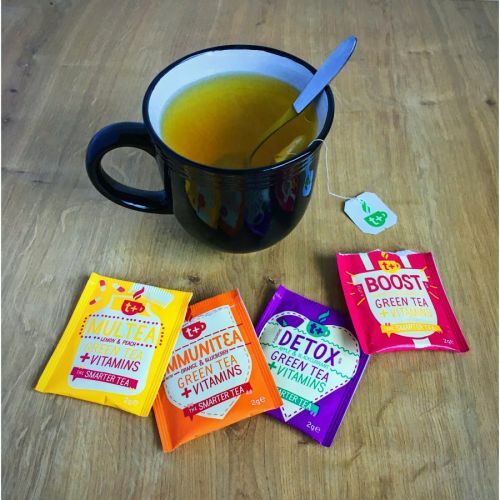 Immunitea – Green tea with orange, blueberry, echinacea, ginseng and vitamin C.
My absolute favourite T Plus flavour is the ‘Multea’, which is flavoured with lemon and peach. 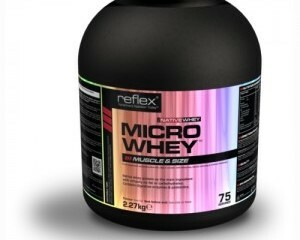 It tastes just as good as it sounds – I have a major sweet tooth and even just the smell of this one is delicious! As far as the teas being enriched with vitamins, I think that’s great! Any way to get extra nutrients in your diet without really having to try is always a bonus and just swapping a few cups of your regular tea a day with these could help you to do that. I won’t lie though – I don’t tend to have more than one cup a day because although I love the taste, tea makes me pee A LOT. So one cup on either every day or every other day gives me that lovely taste and healthy start to the day…without the constant pee trips I would get if I was drinking various cups throughout the day. 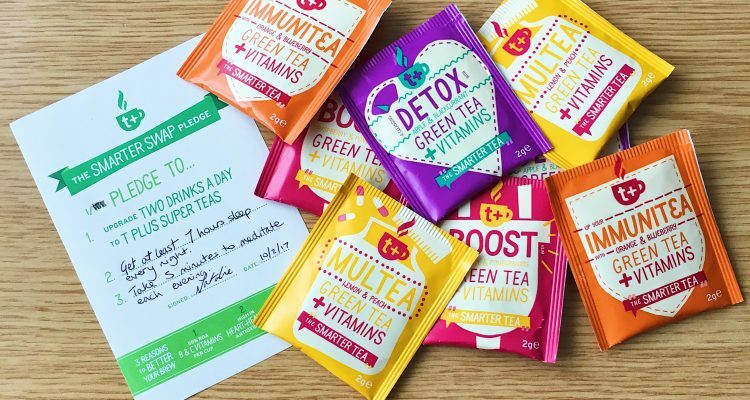 I think it’s fab that T Plus have found a way to add vitamins into the drinks, but I won’t feed you some craziness about how these teas have changed my life or anything because I can’t tell any difference. Just like I don’t see a sudden surge in energy whenever I eat some blueberries or spinach. BUT it’s great knowing that I’m managing to sneak in some extra vitamins and that it’s all helping my body to function optimally. 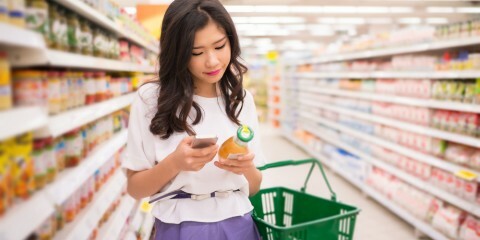 As a way to encourage people to make some healthy changes in their lives, T Plus have set up a new campaign called Smarter Swap, which is all about making a few small changes to eventually see a big change. I think it’s a fantastic idea because you know I’m all about making small changes gradually. My pledge was to get at least seven hours sleep each night and to meditate every night for at least five minutes before bed. I wish I could say that I’ve been super good at doing it every single day since the pledge, but there have occasionally been nights when I’ve been out for family parties, etc, so I ended up having a pretty small amount of sleep. BUT most nights for the past few weeks I have managed to get at least seven hours sleep, yay! That might sound terrible to some of you, but for someone who used to go to bed around 2-3am and wake up at around 7-8am most nights because of uni and work deadlines, getting a solid seven hours sleep almost every night is amazing!! I’ve been sticking to my Headspace app most nights too and have managed to meditate fairly often, but it’s not been every night. I’m hoping to get it up to at least five nights every week meditating though because I really feel the difference when I take five minutes to do that before bed each night. I sleep so much better because it’s like I’ve put everything in my mind in its own little box before I drift off to sleep. You can get involved in the T plus #SmarterSwap pledge here. At £3.69 per pack of 15 teabags these don’t cost that much more than other herbal and fruit teas and they’re definitely worth trying because of the added nutritional benefits. 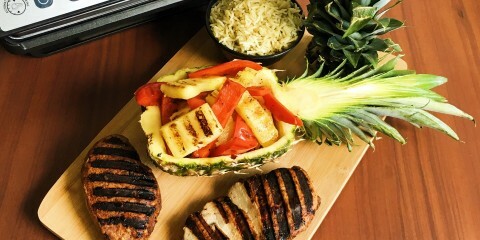 Check out T Plus and make your own pledge! 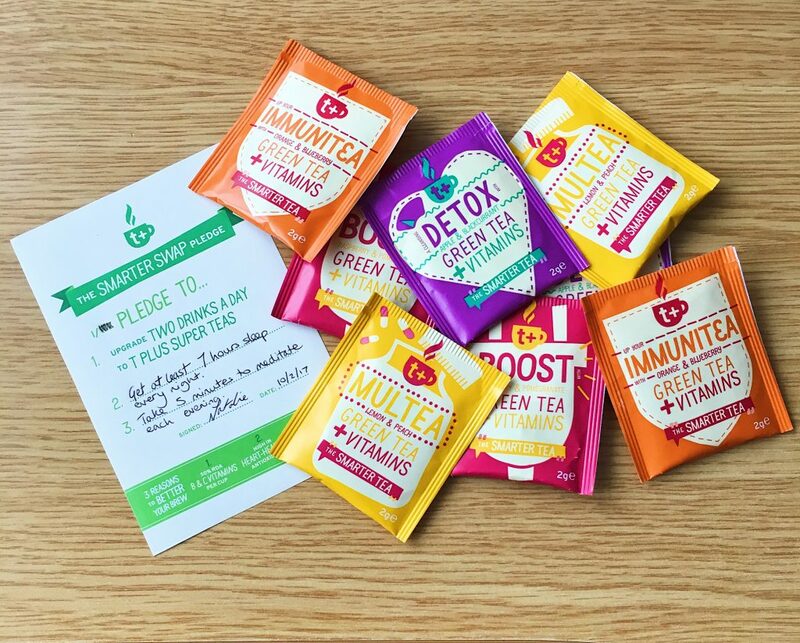 This post isn’t sponsored as they haven’t paid me – they just sent me some tea bags to try and I love their #SmarterSwap campaign so was happy to get involved!